Tintin in America is the third comic of Adventure of Tintin series. The original Black & White version comic published weekly from September 1931 to October 1932 at Le Vingtième Siècle for its children's supplement Le Petit Vingtième. 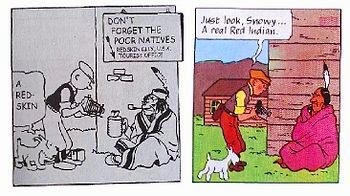 The comic is colored and edited to make it more Indian friendly in 1946. You will get colorize edition here. More Indian friendly Tintin in second (colored) edition. Tintin visit Chicago, America and confront with gangster syndicate. The syndicate leader is famous gangster Al Capone*. Here Tintin and Snowy get the test of real west (!) with full of (native) Indians and cowboys. * Do you know that Al Capone was a real world person? He is probably only real world person in Tintin. Click Here to know more about Al Capone.